My dad was a rural soul, despite a closet full of suits and a house in the suburbs of Birmingham, Alabama. This notion first presented itself when I ate supper at a kindergarten chum’s house and made a puzzling discovery: Her family ate beans from tin cans. Until then I thought beans came from jars. After all, jars of beans, tomatoes, peppers, beets, and bread-and-butter pickle lined shelves in our playroom. Jars of muscadine grape, peach, pear, and blackberry jam glowed like jewels next to the Pachinko machine. Boxes of empty Mason jars—awaiting next season’s harvest—towered on the upright piano. Lucky? I didn’t think so. While the neighbors’ kids played kickball on Saturday afternoons, the Hamrick children sharecropped the easement. Dad had a powerful ambition: transplanting the traditions of Talking Rock—his childhood home in North Georgia—to a strip of Alabama soil. But Martha, Bud, Mary, Peggy, and I did not feel sentimental about growing squash, cucumbers, tomatoes, okra, corn, and beans, beans, beans. The workload doubled when our father got the neighbor’s permission to plow his easement, providing room for all sorts of beans: McCaslin, Blue Lake, Rattle Snake, and Kentucky Wonder-151. By early July, vines strangled the poles, their lush leaves hiding pods. Baskets in hand, we trudged to our appointed rows. How we ached after an hour of reaching high and bending low. How we longed for a drizzle to relieve sweat-stung brows and itching, vine-brushed arms. No wonder I groaned years later on reading Thoreau’s bean chapter in Walden: “I cherish them, I hoe them, early and late. . . . It is a fine broad leaf to look on.” He could idealize agricultural experiments; he never suffered Alabama’s growing season in the dog days of summer. Tom Sawyer proved a more inspiring literary figure. He turned the chore of whitewashing a fence into an enviable pleasure, so we determined to give humble string beans cachet. My brother Bud figured that if each of us invited a friend to drop by at four o’clock, five kids would show up about the time we started stringing our just-picked produce on the patio. With a little playacting, 20 hands instead of 10 would be on task. “Do y’all have to string all those beans?” a curious onlooker inquired. “Sure, nothin’ to it.” Martha was the smoothest talker of us all. “Really?” another wide-eyed child asked. “Oh, yeah. Last week we strung twice as many,” Martha said nonchalantly, knowing that this audience would soon be captive. “I don’t know. . . . It takes most people two years to develop the technique.” Martha flicked her wrist as she snap-snapped. Ah, the art of delegation. Indeed, anything mechanized was a thrill. If the citizens of Fairmount—about 10 miles away—spotted a car, they called his father’s general store that it was on the way. Then a crowd gathered by the side of the road to watch it go by. Sometimes Dad got carried away with his storytelling. One of my friends went goggle-eyed on seeing my father stack 15 quarts of just-creamed Silver Queen corn in one of the playroom freezers. “Why are you putting up all that corn?” she asked. “Haven’t you heard about the famine?” he said, looking dumbfounded. “Have you heard the story of the Little Red Hen?” Dad looked at her sidewise and then inspected the sage and rosemary drying on the pool table. The girl ran home to report the imminent weather disaster to her mother, who promptly called my mother in a panic. Dad turned to folklore to fend off rabbits, squirrels, and other interlopers. 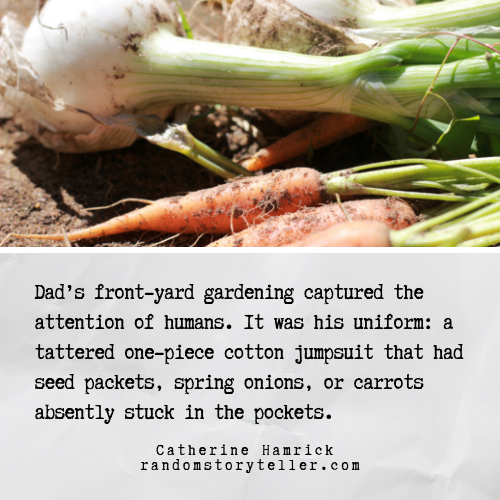 Once during Sunday dinner, he noted that human hair scattered around plants supposedly warded off animals; he eyed my two waist-length braids. Fortunately, it was a passing thought. Watering the “back 40” became Dad’s obsession. Hoses snaked through the backyard and then wound around metal laundry line poles staked every three rows. Lawn sprinklers topped the poles, sending wave after wave of precious drops during dry spells. When picking vegetables under a beating sun, we refreshed under these automatic showers. Dad dreamed up this irrigation system after he spotted a hose sale in a Home Depot circular. When he came home with his prize purchases, Mom was not happy. Some hoses were tan and orange, not color-coordinated green. Shocker: the local power crew had tromped through the easement the day before, spraying herbicide. Dad lit the first match. Whoosh! It was a barnburner. The trampoline mat melted in 3 seconds. About then, the firefighters, whose station sat atop the next ridge, spotted the conflagration. They sat on their porch for years, entertained by my dad’s eccentricities. They good-naturedly climbed the woodsy hill and hosed off the easement in minutes. Thereafter the next-door neighbors kept long hoses screwed into outdoor faucets—just in case. “I earn a good rate here,” Dad said, leaning on his rake. “I’ll top any price,” she bargained. “I get homemade lunches and fresh-squeezed lemonade and brownies on breaks,” he said, cocking his head. “I’ll prepare any food you want,” she insisted. “I also get a special bonus,” he smiled wickedly. The woman backed her car out of the drive, from 0 to 40 mph in 2 seconds. Certainly, Dad’s country habits nourished the body. And sweetly they comforted the soul. 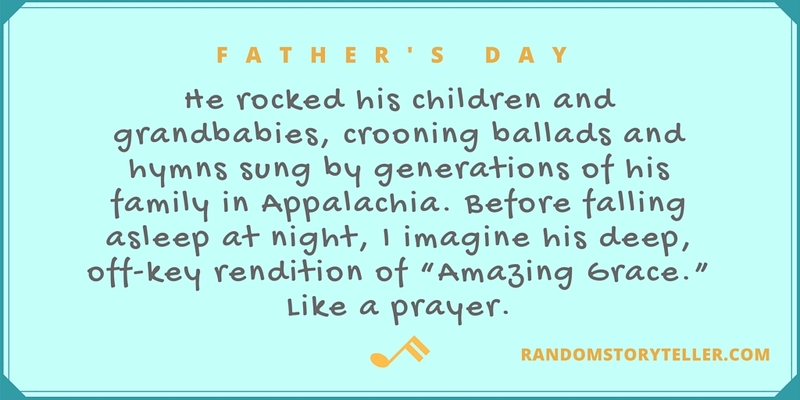 He rocked his children and grandbabies, crooning ballads and hymns sung by generations of his family in Appalachia. Before falling asleep at night, I imagine his deep, off-key rendition of “Amazing Grace.” Like a prayer. You brightened up my day, especially with the Amazing Grace epilogue. A beautiful paean to the past, as usual, but those last two lines, Catherine, well, they stole my heart. Shimmering…. Lori, many thanks for reading and encouraging. You are so kind. There are many stories that we could swap. I hope one day to get to Boston for a story fest! Ah Willie Nelson…. one of the great voices! My grandparents were hicks in Kansas City. Great people. They canned food but also were depression scarred and had a service called guaranteed foods that brought cans and cans and cans to them every month. They could have eaten during the apocalypse for a year. They weren’t Mormon but they could be the envy of Mormons. Funny, I have a bit of that in me. I the event of a national disaster, I have friends in the neighborhood that would provide the guns, some that would provide the generator, others that could filter our lake water and of course, I’d be the one to provide the food. Karen, thanks for stopping by. The Great Depression truly shaped a generation. A steely people. It is the end of an era. So glad we caught up! Beautifully brought to life. An American educational piece, for those of us from other parts of the world. Thank you Storyteller. A memorable blog by American Storyteller. Worth reading. Hi Dr. M. I believe you are the source of my connection to UK readers. A few pop up every day–at least when I look at my stats. Thank you for being oh-so-faithful! I’m so delighted. But can’t keep such excellent blogs to myself. Got to share around. Keep them coming my Storyteller. This was hilarious! You’ve obviously inherited your Dad’s gift for storytelling. Thanks, Phil. I love your blog! So glad The English Professor steered me there. Huckleberry Hamrick strikes again! I remember being a slave to my mother’s tomato addiction in the summer, weeding and getting all itchy from the fuzzy tomato leaves. But I was never able (or sneaky enough?) to convince anyone to help me. Remarks by former suffering backyard child laborers are popping up in my emails! I don’t know why I didn’t see this in my Reader! But in any event, so glad I’ve read it now. This is a beautiful post full of humor, love, and tenderness. Your last few lines brought tears to my eyes. Thank you! Thank you, as always, for your kind words. Your blog is a joy to read. My first time reading one of your posts, and I do believe I’m hooked! I grew up on veggies in canning jars too…..
Great post! Your dad sounds like a fine man. Hi Dianna. Thanks for stopping by. So glad I found your writing! A heart-warming story, Catherine! I love stories that look back on earlier, simpler times. Hi Catherine – first time over here. What a tribute to your father! Have you carried on the gardening tradition or did the Alabama heat turn you off after you were on your own? We have a small raised-bed garden of tomatoes, squash, and herbs. The community market grows the rest. My dad grew up on a small farm, and my mother was a botany major. Gardening hit genetic overload in that generation. Even when Birmingham’s most beloved floral designer was running low on greenery, she let herself in the back gate and clipped away. a novel in the works! Cheers to you, Gina! Thanks for all the wonderful thoughts you share with the world in your blog. There ya go! Farmer Leon validated. Alas, my head is now shorn. Thanks for the follow! Glad we found each other.